Resident Ultimate Fighting Championship (UFC) walkoff knockout artist, Mark Hunt, will return to mixed martial arts (MMA) action tomorrow afternoon (Sat., Sept. 15, 2018) when he battles Brazilian jiu-jitsu stylist, Aleksei Oleinik, in UFC Fight Night 136’s main event inside Olympic Arena in Moscow, Russia. Hunt and Oleinik hit their respective marks on the scale, with “Super Samoan” using every bit of his 265-pound allowance (full results here). Jin Soo Son and Mairbek Taisumov were not as professional, though, as both fighters came in heavy and will have to surrender significant percentages of their purses. 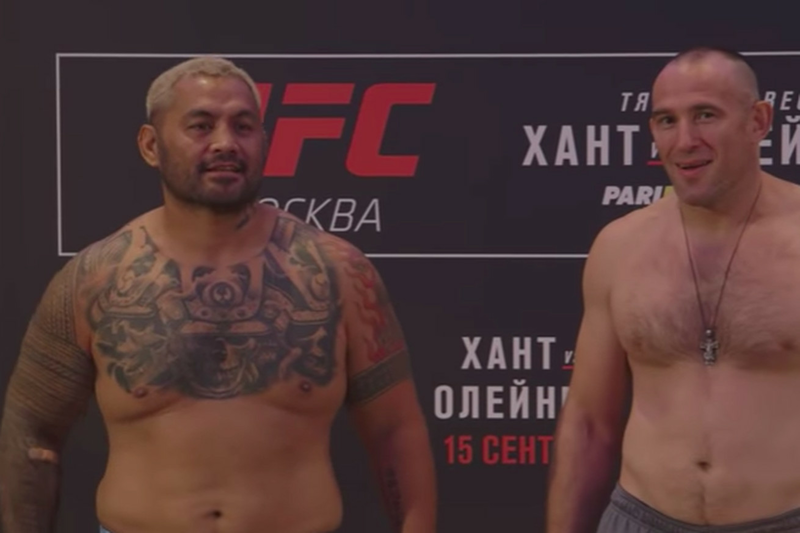 Anyway, at the conclusion of the weigh ins, all 24 fighters were paired off for the official staredowns, and as you can see, Hunt and Oleinik were hamming it up one last time before they have to beat the snot out of each other. See the entire UFC Fight Night 136 fight card and line up here. MMAmania.com will deliver LIVE round-by-round, blow-by-blow coverage of the entire UFC Fight Night 136 fight card, starting with the Fight Pass “Prelims” matches online, which are scheduled to begin at 10:30 a.m. ET, followed by the main card start time of 2 p.m. ET, also on Fight Pass. For much more on this weekend’s UFC Fight Night 136 event click here.